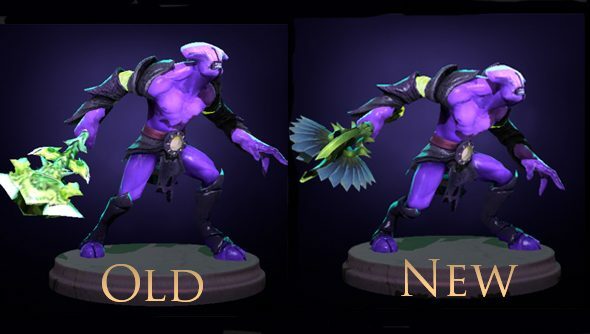 Last week, the Dota 2 community spotted that one of the items included in Sithil’s Summer Bundle, wasn’t exactly original. This is a bundle full of community made items that are all supposed to be original, creative and earning the creators of them money. So when one of them is a lift of a model taken directly from Aion, the MMO with all the flying and elves, and all the person who submitted it has done is give it a green paintjob, that’s really not ok.
What is ok is how Valve have handled it. In the latest patch they’ve replaced the offending item, called the ‘Timebreaker’, with a new model, which fixes the copyright issue of using another game’s work. More than that, though, is that they’ve made all existing Timebreakers ‘Vintage’, a signifier taken over from Team Fortress 2 that’s used to denote an item attained before it was available in the shop. They’ve also made it so that there will be no new Timebreakers in the game, adding a second classification to the item of ‘Immortal’. So now the 24,000 people with Timebreakers have a unique item of which there are only 24,000 copies. As you might imagine, the Dota 2 trading forums are going a little insane. Valve have posted an update about the whole issue on the Workshop blog, imploring the community to police itself, flagging up items such at the Timebreaker so that this kind of situation doesn’t arise again. As for the player who submitted the plagiarised item, he’s had a Steam Community ban and has been banned from ever submitting an item to the shop again, as well as having the $15,000 of profit he’d have made from people buying keys to the bundle to get the mace confiscated.